The Mutton Eaters form a group of armchair sleuths who study the Borden case and who meet one weekend a year in the Spring to discuss and present research achieved during the year. 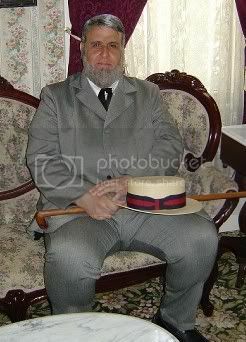 They have an annual banquet and awards dinner, carry out experiments at the house on Second Street, and from time to time dress in period costume to make appearances in Fall River when requested. They are the Fall River scion group of the Second Street Irregulars, a society originally founded by six friends who met at the 1992 Lizzie Borden BCC Centennial at Bristol Community College. They maintan their own web site at http://secondstreetirregulars.org\ Membership is by invitation. “Mutton Eaters” draws its reference to the famous breakfast menu served to the Bordens on the day of the murders. What’s the difference between the Mutton Eaters and the P.E.P. (Pear Essential Production) players? The P.E.P. players perform only once a year on August 4th during the anniversary of the Borden crimes. 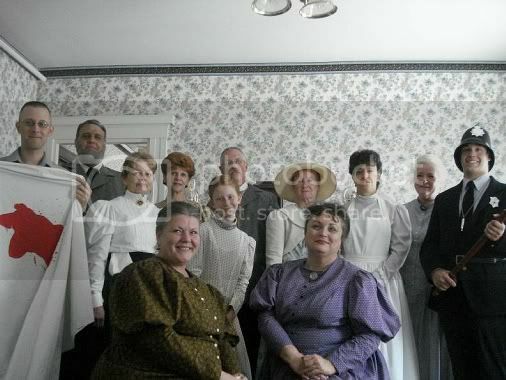 This group is affiliated with the Lizzie Borden Bed & Breakfast Museum. Many of the Players are incidentally Second Street Irregular Mutton Eaters and members of the Lizzie Borden Society. Pears were a motif throughout the testimony of Lizzie Borden and other family members during the Inquest. Pears were eaten by Miss Borden in the hayloft and were essentially her alibi as to why she was so long up in the hayloft while her father was killed in the house. What a wonderful site! I would love to see the play. Please let me know when the next play is going to be performed. Hi Diane! The production is always on August 4th and begins at 10:30 am with repeats about every 35 minutes until 3:30. There is a lunch break from 12- 12:30. Tickets are available in the gift shop barn. Hope to see you next year. I ENJOYED THE LIZZIE MINIS.IN THE “BRIDGET RUN TEST”,I WONDER HOW MUCH LONGER, IT WOULD OF TAKEN THE ACTRESS WHO PLAYED BRIDGET TO DO ALL THAT SHE DID IN THAT TEST. IF SHE WOULD HAVE BEEN SICK,ON A HOT AUGUST DAY AND IN CLOTHES THAT BRIDGET MIGHT HAVE WORN . I THINK IT WOULD HAVE TAKEN LONGR THAN 6 MIN 15 SEC, PLENTY OF TIME TO GET RID OF EVIDENCE!